Whoever said “timing is everything” might have been talking about Suzie’s Farm. 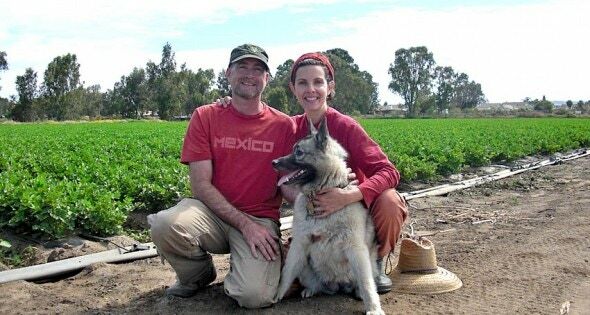 The organic success story in the San Diego area began with Robin Taylor and his wife Lucila De Alejandro “just playing around”—but it wasn’t long before they discovered that the organic vegetables they were planting to feed their family were in great demand. Three years and 140 acres later, Suzie’s Farm (named for a dog found on the property) is a howling success. “We had a little extra piece of property that we weren’t using,” Robin Taylor told Calmful Living. “So we just started playing around and providing food for ourselves and our friends. We didn’t realize that we were hitting optimum time for the local market, and that we’d have to get another 70 acres just to keep up. As Taylor himself was taught and continues to learn from others, so is he using Suzie’s Farm to correctly educate the next generation. “We’re really trying to promote education along with our produce,” Taylor said. “Just about every week we have busloads of kids come in. They pull stuff out of the dirt and eat it, not worrying about how everything has to be perfectly clean. They see how vegetables really look; our vegetables are not sized and perfect like you usually see in the grocery store. Thanks to organic, sustainable farmers like Robin Taylor, we will continue to experience nature’s rich food heritage for generations to come. For more information, please visit www.suziesfarm.com.